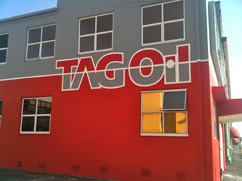 Check out our new home. 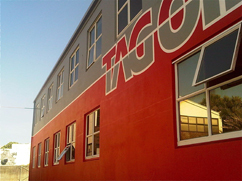 TAG’s new field office is making quite a splash in New Plymouth…mostly good…. Why not have a little fun, right? Third time’s a charm…Sidewinder oil and gas discovery does it again. 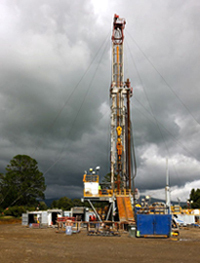 The rig is a thing of beauty against heavy grey clouds. PEP 38748 and Mt. Messenger do it again…the Company just announced that Sidewinder-3 is confirmed as a light oil and gas discovery. It’s been a busy couple of days: we drilled to 2160 meters about 1 km south of our Sidewinder-1 discovery, targeting a large anomaly ID’d on 3-D seismic. We encountered 15.4 meters of net oil-and-gas-bearing sandstones in the primary Sidewinder zone, including "free oil" observed over the shakers during the drilling operation. With each new well we can more accurately calibrate our 3-D data set and better understand the geology of our acreage. In particular, Sidewinder-3 has shown that the Mt. Messenger Formation reservoir sands extend significantly to the south of the original Sidewinder discoveries, and hydrocarbons appear to have migrated into all potentially producing sands encountered to date. Good news for both near-term development and future exploration. No time to rest on our laurels, it’s time to get busy on the Sidewinder-4 exploration well off to the east.